Things almost got very dark in Mission: Impossible - Fallout. That's not to say the movie isn't a bit on the shady side as is. The stakes are very high and millions of people's lives are on the table, with Tom Cruise's Ethan Hunt and his team being the only thing that can prevent a whole bunch of unnecessary deaths. However, as revealed by director Christopher McQuarrie, it turns out Ethan Hunt almost had a pretty sinister turn in his latest outing. Warning: spoilers ahead for Mission: Impossible - Fallout. Christopher McQuarrie has been making the rounds to promote MI6, which just dominated the box office over the weekend and currently stands as Tom Cruise's highest-rated movie on Rotten Tomatoes. Cruise has been playing the role for more than two decades and, according to McQuarrie, in a plot that didn't make it into this movie but may or may not be used later on, Hunt almost went to a dark place. While the writer/director wouldn't go into specifics, the original plot would have seen Hunt posing as John Lark for a longer period of the movie. This would have led to him doing "horrible things." Ultimately, it was axed because McQuarrie said it would have robbed the movie of the charm that comes with this franchise and would have made it too "intellectual." The director was asked if Ethan every had to make the "hard choice" in actually killing an innocent when he was posing as "John Lark" just to maintain his cover? Here's how McQuarrie responded. "I'm going to withhold a detailed answer to that because the lesson I have learned is that anything we throw out comes back. The example being: when Lane says to Ethan, 'Your mission should you choose to accept it... did you ever choose not to...?' that was a scene we cut out of Rogue Nation. There was a confrontation between them earlier in the film, and for a lot of reasons, we had to take it out. Ultimately, I was grateful that we did because it was in the wrong place. And then, it came back to work in Fallout. I will say that I wrote a scene that took Ethan to a very dark place, and when I pitched it to Tom, he said, 'Well, how about this?' Tom took the scene even darker, and I was quite surprised. I said, 'Do you really want to go there with Ethan?' Tom replied, 'If we're going to go for it, let's go for it.' So, it taught me something in terms of the boundaries of this character and the boundaries this franchise are even more limitless than I thought." Ethan Hunt was put in some particularly precarious situations in Mission: Impossible 6. Specifically, he nearly had to take an innocent life or two in order to save millions. At the end of the day, Hunt was spared having to make such a dark decision, though, it sounds like something just that bad if not worse was on the table. Christopher McQuarrie also explained that Ilsa (Rebecca Ferguson) didn't kiss Ethan again, though a kiss was filmed, because he wasn't ready to "define what their relationship is." Much of that had to do with the fact that this movie was about Ethan resolving his story with Julia (Michelle Monaghan). Ultimately, what made it to screen has worked out very well. Christopher McQuarrie is the only director to helm two movies in the franchise and he's worked with Tom Cruise a bunch over the course of the last decade or so. Mission: Impossible - Fallout suffered some pretty serious setbacks during production. Namely, Tom Cruise's broken ankle, amongst other things. However, McQuarrie reveals that they both view such setbacks as an opportunity to better the movie they're making. "Tom and I have learned from having made nine movies together in 12 years. Disaster is an opportunity to excel. When things go wrong, it forces you to be more creative, and you invariably finish the movie looking back on that thing and say, "Boy, if that hadn't happened, just imagine what the movie would have been like if we'd gone according to plan." If Tom hadn't broken his ankle or if the weather had been going our way on a specific day, you learn to embrace that stuff. You accept it as part of the process and just take it for what it is. Chaos is a very important part of the process, at least for us. It's an ingredient. It's not anything we enjoy. I'm not one of those people who invites or creates chaos. When it comes, I know it's the greatest gift in the ugliest packaging." Broken ankle or no broken ankle, this is a combo that has proved to be one that delivers in the quality department. 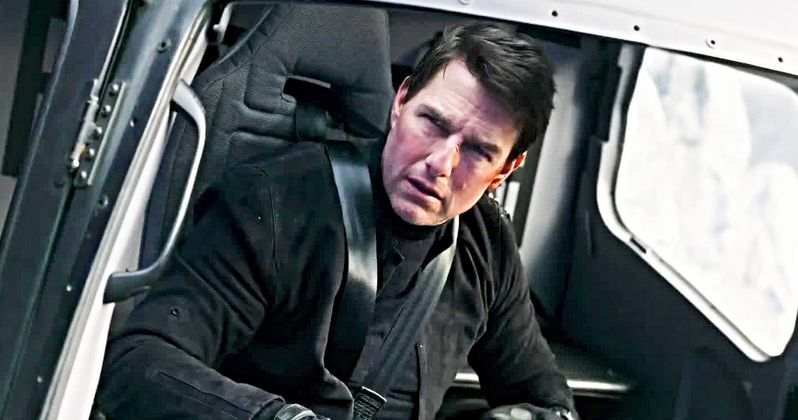 If Mission: Impossible 7 happens, and there's no reason to think it won't at this point, don't be surprised to hear that McQuarrie and Cruise will be teaming up once again. And possibly going to a very dark place. To check out the full interview you can head on over to The Hollywood Reporter.